AI Lati Lights combines timeless architectural fixtures with finely hand-crafted shades to create gorgeous contemporary pieces . The beguiling simplicity of their lighting only serves to accentuate their beautiful designs. 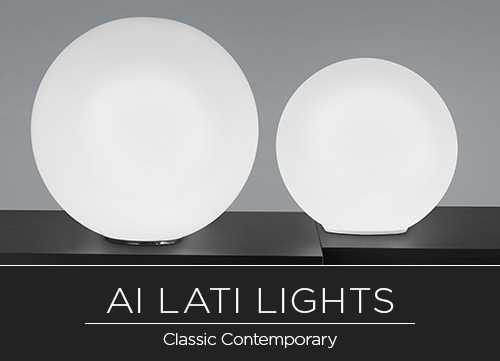 Ai Lati illuminates with the unique elegance of opal glass, which lends exquisite beauty to light and diffuses it with harmonious evenness for complete visual comfort. Our design philosophy is to combine simple, timeless architectural shapes with the magic of these flawlessly hand-crafted shades. Ai Lati Lights are simple to specify, order, install, assemble and re-lamp. Standard items accept either incandescent or energy-saving fluorescent light bulbs, and custom-made versions with solid-state lamping (LED) are available.